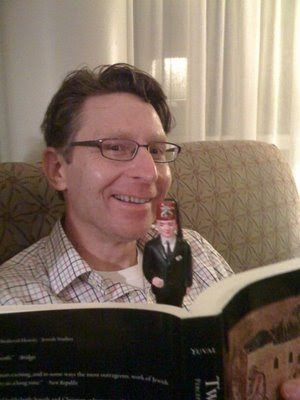 ... is rereading Karl Steel's copy of Israel Yuval's book with you, where else could you be but Kalamazoo? Don't be fooled everyone: "reading" is the *last* thing Jeffrey and Tiny are doing behind that book, and frankly, I'm disgusted. Especially since they didn't invite me back there. Who can resist the plastic pleasures of the Tiny's heiney? It is true, I was goosing him, hence his smile.